Параматры: Формат 60х90/8, 160 стр.. Registered by the Russian Press Committee. Certificate of registration No. 013973 dated July 31, 1995. ANO Publishing House "Narodnoe obrazovanie" (National Education). Scientific and practical journal. Professional magazine for technologists of the educational business, school teachers, methodologists, teachers of the higher education system. Main headings: "Sociocultural and pedagogical contexts of technological development"; "Concepts, models, projects"; "Implementation and practice"; "Pedagogical equipment", "Expertise, measurements, diagnostics". Characteristics: Format 60х90/8, 160 pages. 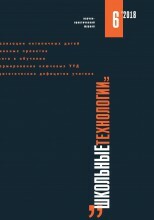 Publisher: ANO "Publishing house" Narodnoe obrazovanie "